In this example the word cloud is a manipulative message driving tool that is mis-used to promote certain ideas over other ideas. In this particular representation we are led to thinking that 'Population Health" is an important concept and related critically to other concepts including "Care Coordination" and "Triple Aim" and "Outcomes" and "Patient Centered." The words are neatly arranged in appealing colors and in various sizes so that certain messages will catch our attention. But what is the source of the data that is used to populate the word cloud? 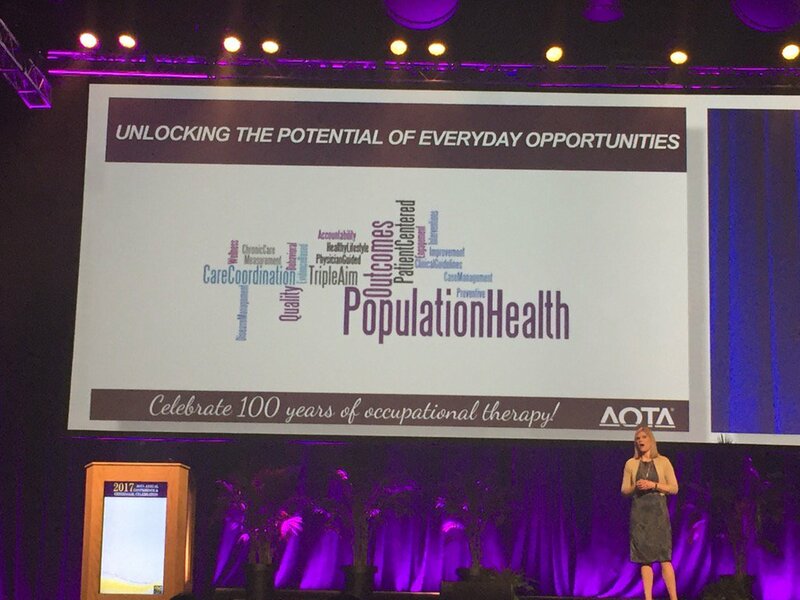 Are we supposed to believe that these words represent occupational therapy practice? Or occupational therapy values? Or something that some academic dreamed up after nodding off during a Donald Berwick lecture? We are never given that information. We are simply presented with words, and led to believe that they are important. We are led into a state of obsequity, and it is assumed that we should just trust the messenger. In a presentation at the 2015 OT24VX online conference I stated that some occupational therapists are promoting a Fourth Paradigm concept focusing on population health and its relation to the "rights" and "justice" framework. The occupational justice paradigm, represented in a General Systems Theory framework, looks quite different from the contemporary paradigm that focuses on occupation. Instead of intervening at the level of the individual the new model suggests intervention at higher levels of social and cultural complexity. These new models all emerged out of the mid-1990s, a time where we have to consider the impact of the Internet and subsequent globalization of the profession. Through the proliferation of journals and the increased international communication, occupational science became a world-wide academic discipline. Suddenly we were contending with concepts of occupational justice, sustainability, climate change, and broad public health - ideas that were very new to an occupational therapy context and that don't always have social and political fit across international contexts. Many people question whether these ideas even fit into occupational therapy practice at all. There is still little agreement among proponents of these models what all of the ideas actually mean or how they are translated into practice to help people and reimbursed by third parties. In fact the academics are still writing word cloud articles and admitting that their concepts have no logical coherence or systematization for practice (Hammell, 2017). That does not seem to dissuade the motivated messengers. edit: (added) Social media chatter apparently precedes action. I just learned that a group has created a new forum on OT Connections where they can congregate and discuss their ideas. The group, predictably, is comprised of almost all academicians and will be functionally sequestered and insulated from feedback from the profession at large via the protective membership paywall of AOTA. 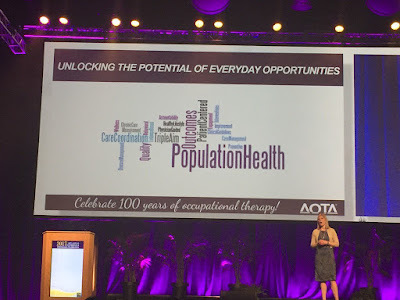 During the business meeting at conference we learned that half of all AOTA members are students who are frequently mandated to join by their academic programs, and a sizable but undisclosed number of other members are their professors. This creates a questionable context to hold a conversation about practice. Would the group be willing to move their conversation to a place where more practitioners would be more able to participate? I encourage population health or public health or occupational justice or social justice proponents to stop feeding the profession these word clouds (whether presented at a conference or in an academic journal) and instead try linking these ideas to real practice where they can be tested against reality of specific care contexts. The proponents of these ideas should also specifically address the many questions that have already been raised. Practitioners in the US see that social justice was taken out as an enforceable principle in the Code of Ethics. They have seen a statement on sustainability go up in flames in the RA. But they still see leaders promoting these same ideas in context of poorly defined population health models. Proponents of these ideas need to explain the justification for continued adherence to poorly defined ideas that have been the source of significant professional disagreement.